Get ready West Michigan. 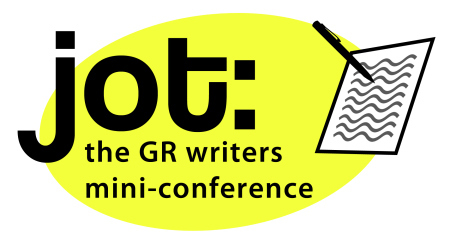 Jot 3 the GR mini writers conference is next week March 14th! We have reached out to each presenter for an interview to help the audience get to know them better before the conference. Even if you are not in West Michigan, or on this side of the world, I wanted to include the information here on my blog. For the ful list of presenters, please go here. The link to Indie author Thomas McClurg’s interview on What Novelists Can Learn from Screenwriters is here.